ASUS Transformer 3 Pro is a 2-in-1 PC that is only 8.35mm thin and it is available in Icicle Gold and Glacier Gray color options. Yes, I'm opening this review with a "cord" pun, because let's face it, that's the most conspicuous feature of the ASUS PT201Q...that tethered stylus. Given the forgettable Lexus sedan-style name, it's also the one thing you'll most certainly remember about it. Let's get the big stuff out of the way first. This is a product from a company not known for this type of hardware, it's got a proprietary tethered stylus, and a name only the US Military could love. You should just stop reading now and ignore this hopeless imposter, right? This unit from ASUS is different, yes. It has some quirks, definitely. It is, however, worth a closer look, because for some of you, this might be all you need and quite a bit more than you'd expect. Depending on the price at which you purchase it, the needs you have for your art, and your willingness to try a few small tweaks on the pen, I think this is more than just a base hit, it could be a home run. Check out the video review for what I hope is a fairly comprehensive overview of its virtues and vices. Bucktoothstudios.com video review of ASUS PT201Q tablet monitor pen display. This is part 1 of 2 which focuses on the hardware itself and setup. Part 2 covers the pen and drawing tests as well. bucktoothstudios.com video review of ASUS PT201Q tablet monitor pen display. In part 2 I look at the pen itself and how it performs in areas like pressure sensitivity, hover distance, and stability. I’m not the target consumer for the Asus Vivotab Note 8. It’s important to get that out of the way up front because as I sit to write this post, my ambivalence about this product has almost nothing to do with its design or implementation. 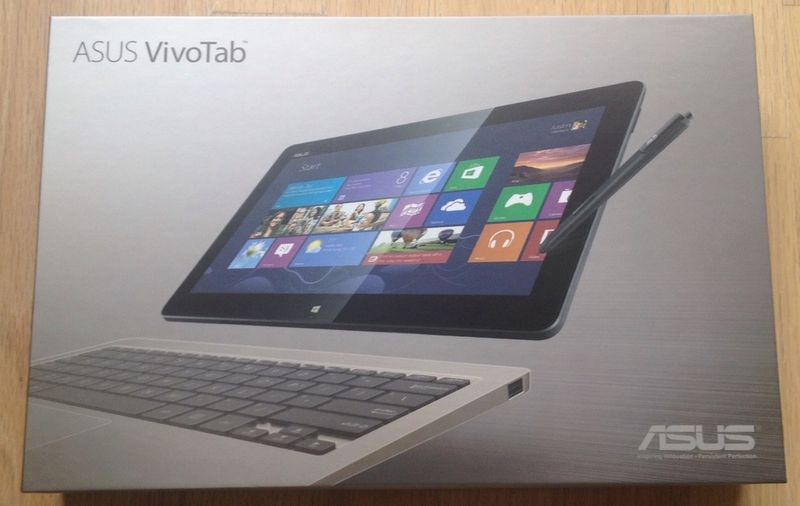 The AVTN8 is a very nice, reasonably-priced entrant into the Windows 8 tablet arena. And since it’s one of the few such devices to include a digitizer, let alone a Wacom digitizer, it clearly demands to be covered in this space. My misgivings are all about the real world use case for this product. Judging by the enthusiasm around the AVTN8’s announcement, the obvious popularity of the Dell Venue 8 and the anticipation for the upcoming Lenovo Thinkpad 8, Windows artists are clearly clamoring for a small drawing tablet. But my question is why? Setting aside portability, I'm afraid that too many of you are simply looking at price and failing to consider the corners that had to be cut to achieve its ~$300 price point. Moreover, I'm concerned some have ignored the deeply discounted original Surface Pro while waiting for this spring's round of 8-inchers. My message is simple: even at the current US price of $679, the Surface Pro 4/128 is a much better value for artists than the $329 Asus VivoTab Note 8, which has no ports, much lower resolution, a slower processor, half the RAM and one quarter the storage. Is the AVTN8 worth buying in addition to a Surface Pro or other Windows tablet? Perhaps, but even then I struggle to see how often you will actually use it. Many of you have mentioned that you really enjoy Samsung's line of Android phablets and are accustomed to working on their smallish screens with an S-pen. But since the AVTN8 has no phone capability, will you carry this around in addition to a phone? If you're going to toss it in a backpack or briefcase, wouldn't a 10-inch tablet fit just as well? By comparison to Android or iOS devices, the biggest selling point of the AVTN8--its ability to run full Windows 8.1--is also its biggest disadvantage. Everything I've thrown at it so far seems to run ok on the tablet (it even ships with Office Home & Student 2013). But how long do you really want to look at desktop interfaces on an 8-inch 1280 x 800 display? This entire category of devices is only a glaring reminder of how immature the Windows Store environment continues to be. Where is the Modern, touch-friendly version of Office, Microsoft? Why haven't popular iOS paint apps been ported to Windows yet? Why aren't Sketchbook Pro and ArtRage sold through the Windows Store? I'll stop ranting now, because I know I risk sounding like Paul Thurrott. If you've got the spare cash lying around and aren't going to try to use the AVTN8 for critical artistic work, go for it. But if you feel like you can't afford the Surface Pro but you really need a tablet to pursue your creative endeavors, please think long and hard before taking this plunge. 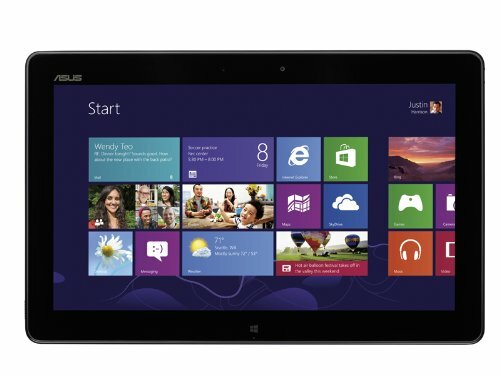 The $299 Asus Vivotab Note 8 (M80TA) was first announced at CES 2014 with a March release date. It showed up in the Microsoft Stores unexpectedly on Sunday, selling for $30 more. Yesterday, it was pulled from the Microsoft online site and isn't available for sale anywhere else that I can find. It's unclear whether this now-you-see-it, now-you-don't release was a mistake, but as of now we can only assume that the product will go back on sale soon. A 64 GB version is also due in March, although a price has not been announced. The sudden arrival Sunday of the Asus Vivotab Note 8 at Microsoft Stores in the U.S. took everyone by surprise. I picked up this 32GB version for $329. Given its budget pricing, packaging of the AVTN8 is very spartan. The included quick start guide contains only two instructions: press power to turn the tablet on and charge it for 8 hours prior to initial use. That's it. The Asus US site doesn't list or contain any additional technical information for the product either except for a press release issued for CES. Fortunately, the AVTN8 has only three buttons and an SD card slot, along with a micro USB port and headphone jack. The plastic bezel along the sides of the screen add a somewhat cheap feeling to the product. The volume (left) and power buttons have no discernible markings. To power the device on, you need to hold it down for five seconds. Unlike other Windows tablets, the physical Home button is along the opposite side (top left when the Asus logo is at the bottom in portrait mode). The SD slot comes loaded with an 8 GB card that contains a recovery partition. This is a very nice addition in a 32 GB device. Unlike the Surface Pro, the Asus' default orientation is portrait mode, with the logo at the bottom of the screen. That logo isn't a home button like on the Surfaces or iPad and it took me a day to figure out that the button along the upper left side is the physical home button. Power is on the top right side and beneath it is a volume rocker. The stylus slot is located in the lower right back and the pen fits so snugly you can easily miss it. If you keep your finger nails clipped short, it can be extremely difficult to pry the pen out of the silo. 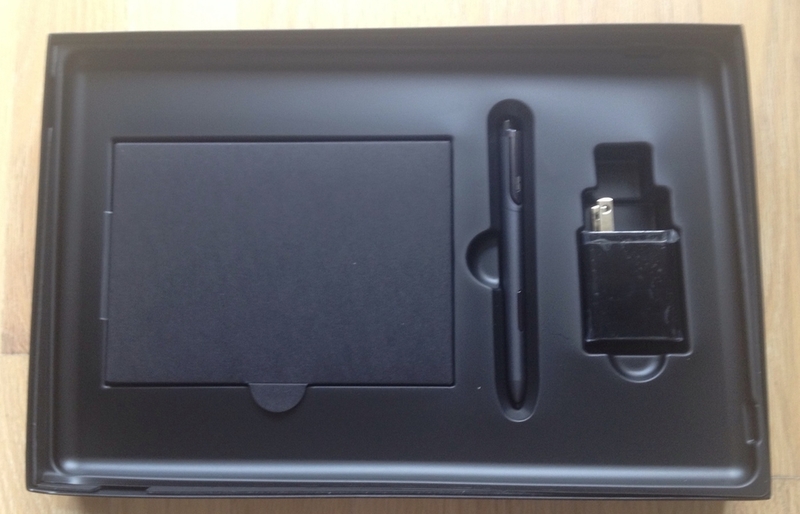 A big calling card for many of you is the dedicated stylus slot. It makes losing a pen less likely for sure, but forces the stylus to be little more than a pointing stick. The stylus fits so snugly into the Vivotab Note 8's back that you may break a fingernail extracting it. Powering up the AVTN8 requires holding down the power button for at least five seconds. When I test Windows 8 devices, I usually will set them up as new desktops, but this time around I chose to sync my Surface Pro 2. That eliminates the need to redo mail, contact, and social network settings. And the layout of the Start screen is also preserved, although individual apps still need to be reinstalled. I neglected to write down the exact space available upon that first boot, but there were a little over 16 GB free on the 32 GB C:\ drive. Asus mercifully includes an 8 GB SD card mounted as D:\ which includes a 3.26 GB recovery file. The IPS display is very nice; as seen in the screenshot below, color reproduction is nearly identical to the Surface Pro 2. I've seen some users complain that type is a little blurred, but it perfectly acceptable to me. At the default scaling, desktop fonts are too small, so I scaled up the UI to 125%. You can go higher, but you will sacrifice a lot of screen space as a result. Side by side (head to toe?) with the Surface Pro 2. As the first Windows 8 device that defaults to portrait mode, there are clearly bugs that need to be worked out with pen drivers. The device can only be calibrated in portrait mode. Attempting to run the calibration tool in landscape mode will only provide registration points for the top left half of the screen. As we've discovered over the last few months, Wacom digitizer sensitivity varies widely . On my AVTN8, the entire right side requires more pressure than the rest of the screen. This makes hitting the top right calibration points next to impossible with the standard stylus. By contrast, I had no problem touching the targets with the Surface Pro pen. Once calibrated, neither pen could access within a few pixels of the right screen edge, so I reset my custom calibration data and am running my AVTN8 with the default calibration. The tablet also has issues with the Wacom Feel IT drivers. Installing these results in input axes being reversed. In other words, when you move your pen left or right (along x), the pointer will move up or down (along y). I tried with the current set of drivers (October, 2013) as well as July. Wacom has reportedly told users that it is aware of the issue and working on a fix. This means that Photoshop users will have to use that software without pressure until the drivers are updated or Adobe enables a Tablet PC mode. As you're no doubt tired of reading, I'm no fan of Adobe's cluttered UIs on tablets, so I didn't bother loading any CC software onto the AVTN8. Instead, I loaded the tried and true Clip Studio Paint (Manga Studio) and Sketchbook Pro. Both run surprisingly well. Even with toolbars and menus minimized, available canvas real estate can feel cramped. This is okay when working with single figures as shown in the examples below but it will take a lot of panning and zooming in and out to work on anything more complicated. Though it's cramped, the tablet runs Clip Studio Paint (aka Manga Studio) and Sketchbook Pro very well. Of the various pens and nibs I've tried, the lowly Surface Pro pen seems to offer the most consistent results. Five minute @Sketch_Dailies #Sherlock. Working at 800x1280, 600 dpi; finding it difficult to get fine control. Screen coating: smudge magnet, pen impediment? The AVTN8 display is the most difficult-to-clean tablet that I've ever used. I was shocked to see that after my first hour or so of setting up the device that the screen was so smudged it looked like I had been eating a greasy burger. Wiping it down took many passes and I had to try a variety of cleaning cloths to get it to be smudge free. Against the standard stylus tip, the surface feels gritty and rough. In some areas, particularly along the edges, it's next to impossible to register a mark. Other pen and nib combinations don't require as much pressure nor do they feel as rough. However, softer nibs like on the Wacom Feel drag uncomfortably on the coating. You'll notice in the photo below that the lines drawn with the Feel and Flex nibs are more curved, particularly at the ends of the strokes as I lighten pressure. 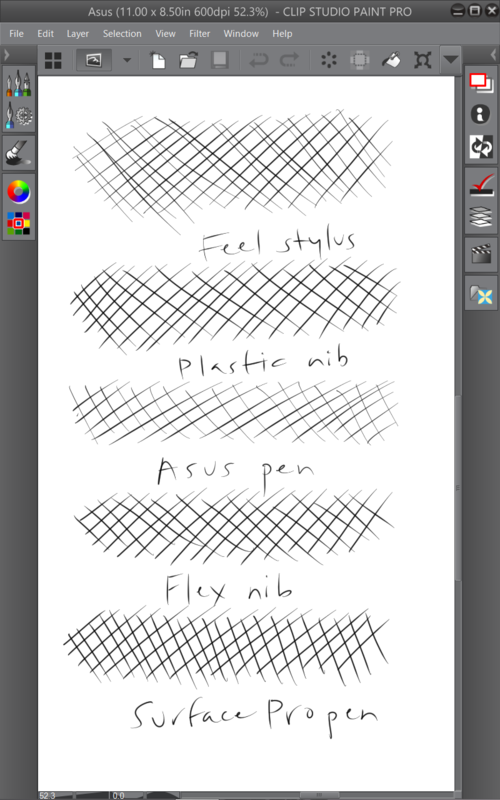 Notice how the ATVN8 stylus strokes are much lighter because that pen requires much greater pressure. The hard nibs on a Wacom Tablet PC pen and the Surface Pro pen yield much more consistent results. Notice how much closer and regular the lines are, especially with the Surface Pro stylus. Unfortunately, this means living with a bit less screen friction than I would like (the feedback feels a bit like skating on ice). One thing I've noticed after three days of drawing and cleaning is that the standard stylus is feeling less rough. It's possible that the screen coating will dissipate over time and it will be easier to clean. That may also mean that it will be possible to transition back to softer nibs after repeated use. Only time will tell. Working at 600 dpi resolution to test the different pens and nibs. Each crosshatch was drawn at pixel size. The picture above is zoomed out to show each pen I tested. The Wacom TabletPC pen with plastic nib and the Surface Pro pen gave the most consistent results. Notice how light the strokes are with the standard stylus (middle). The soft nib of the Feel stylus and the Flex nib on the Fujitsu pen tend to drag on the screen's coating, resulting in all the fish tails at the end of strokes. The pens I tested in the example above. The Asus stylus is reminiscent of a large plastic olive pick. Surprisingly, I found the Surface Pro pen is the best suited for drawing on the Note 8's display coating. Now that I've installed Clip Studio Paint, Sketchbook Pro, ArtRage 4, Sketchable, Fresh Paint and Office, available storage on C:\ is down to 12.5 GB. I'd advise replacing the recovery card with a 32 or 64 GB SD card and dedicated for Documents. Also make sure to set up a SkyDrive (or OneDrive) account. Keep an eye on Windows Store apps which can only be installed to the C:\ drive. In my experience, Windows will always start to act up once available space on C:\ dips below 10%. As I telegraphed in my rant up front, I can't recommend the Asus Vivotab Note 8 for serious work due to its limited RAM and storage, small screen and driver issues. However, if you temper your expectations up front and want it for light sketching and ideating on the go, you could do far worse. The AVTN8 is far better for sketching than any capacitive tablet. And with a driver update or better Windows Store apps, the tablet could get even better in the future. Just please, please, please know what you want and what you're getting into: sometimes you do only get what you pay for.